Clarinet air leak solutions for the embouchure, fingers, pads and cracks. The clarinet air leak can happen in numerous places on wind instruments. My wife and I went to see a very prominent clarinetist in recital. During the recital, my wife, a flutist, was really distracted by something. She was looking up at the ceiling, at the walls, all around. I asked what was wrong. She couldn’t figure out where that “airy” sound was coming from in the room. Maybe it was an air vent or a radiator outlet. I quickly explained, “No, it’s coming from the clarinetist.” Sometimes even the best clarinetists overlook the embouchure air-leak. We spend all of this time in our lives trying to make the best sound we can, fiddling with reeds, getting repairmen to tweak our instruments, but we let a little constant “hissing” stream of air leak from our embouchures. Do you have this clarinet air leak problem at the embouchure all of the time or just sometimes? Often, it is just from being tired. If you practice a long session, or have several ensemble rehearsals in one day, it is probably just fatigue. But, if you have it all of the time, start at least trying on getting control over this. After all, if you play a live concert, the “average Joe” (or someone who never listens to clarinet) will wonder what that hissing sound is. Also, if you are recording, the greatest audio engineer in the world can’t take the air hissing out. Try this. While playing long tones, do you lose air from your embouchure? If so, this is a good place to pinpoint it. Is it the left side, right side, left top of mouth, right top of mouth, corner of mouth, where?? Then, once you pinpoint this, play your long tone again and concentrate on sealing that part of your mouth. Do this until you closed the gap. Now, try this while doing something technical. How about scales, thirds or arpeggios. I bet it will creep back into your playing. Why? You are now concentrating on fingers and notes. The embouchure concentration you had on the long tones is gone. Take the same approach now with your technical lick of your choice. Play and concentrate on your embouchure. Try to close that gap again. One last embouchure air leak test: Now, do that scale articulated. For me, articulated passages always bring out my embouchure air leaks. Why in the world do my lips give way while the tongue is in motion? Probably the same concentration issues. Well, as you can tell, I’m working on this, too. Often for me it is fatigue that brings out the glorious air leak problem. You can get control over this. Again, it just takes discipline and practice. Don’t ignore it as we wish to turn non-clarinetists ONTO the clarinet, not away from it. Yippie!!! 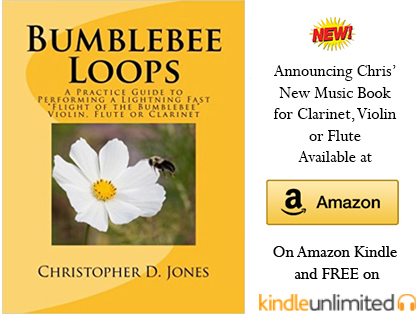 For more information on the Clarinet Embouchure, click here. This is the easiest fix of all clarinet air leak problems. If you are letting air escape from the tone holes, more than likely you are not using the pads of your fingers. I’ve covered this in both clarinet left hand position and clarinet right hand position. Using the pads of your fingers and not the tips is the trick to success here. Using the finger tips does not allow for full coverage of each tone hole. Read the hand position pages for photos and more information on fixing this. While we are on the subject of AIR! !, consider reading here about Clarinet Air Support. Many of us instrumentalists play our instruments to the point of barely getting a sound out of it. We get used to the deficiencies, and play on and on. The clarinet air leak in the pads and/or joints are not the end of the world. An instrument repairman can check these fairly quick with specialized equipment. Often a little suction/blowing test on the upper and lower joint of the instrument can test for leaks. If your corks go bad on the joints, it easy to figure air is leaking there because the joints often will not stay together. A quick fix it to take a small piece of paper and line the tendon joint. This will allow you to practice until a time when you can visit your repair person. Clarinet air leaks with cracks. Yipes, the clarinet crack. This is a feared day for any clarinetist. If you have a plastic clarinet, you do not have to worry about this unless you’ve used your clarinet as a baseball bat (not conducive to clarinet playing). However, wooden clarinets have this possibility. First of all, take good care of your wooden clarinet. Do not have it (even inside its case) in extreme temperatures hot or cold. Leaving it in a hot car or cold car, on a radiator or in an attic are all really bad ideas for wooden clarinets. Also, if your clarinet gets cold on the way to your gig or rehearsal; open the case and let the instrument come to room temperature slowly. Opening the case and going full hilt on a warm-up will very likely cause any piece of wood to crack. It is the quick temperature different and massive change of humidity that makes an instrument crack. Anyway, we were talking about cracks in the wood. Many times the crack is so small that no air will escape from it. This does require the attention of a repairman filling in the crack. This is a very specialized trait. Do not try this unless you bought the clarinet at a flea market for .50 cents (and I've seen clarinets at flea markets, not recommended). Anyway, it is important that you do take care of the crack long before it gets big enough to leak air. Why do clarinets crack? The big instrument companies are not allowing the wood to cure as long as they used to. Also, the demand is so high for granadilla wood that old growth trees are becoming less and less common. So, the companies are cutting down younger trees and not allowing the younger greener logs to cure long enough. This causes many new instruments to crack. While purchasing your clarinet, ask if the store has a crack policy or crack insurance on the instrument. These steps might not stop the cracks, but they might save you some money on repair and/or replacement charges. Now that you completely fixed the Clarinet Air Leak, how about learning about proper Clarinet Air Support.